Last week, news about India’s destruction of one of its satellites spread around the globe. Experts are now worried about the damage the space debris left by the destruction could have on the International Space Station and the astronauts who are currently on it. NASA calls India’s satellite destruction a “terrible, terrible thing,” warning that impacts by the space debris could threaten the ISS. However, in a press conference streamed by NASA TV and posted to YouTube, NASA Administrator Jim Bridenstine said it’s an “unacceptable” threat for the astronauts who live and work on the ISS. He said India’s satellite destruction broke it into pieces large enough to threat the ISS but too small to be tracked by NASA. According to him, it’s still unclear how many pieces were created when the satellite was destroyed. “What we are tracking right now, objects big enough to track — we’re talking about 10cm (four inches) or bigger —about 60 pieces have been tracked,” he said. He said the explosion was strong enough for the debris to reach the ISS, which orbits Earth at about 250 miles above, while the satellite that was destroyed orbited Earth at 185 miles above. More importantly, he added that there’s higher risk of collision between the ISS and debris, which has increased by 44% over 10 days days. Right now six crew members are working onboard the ISS and may be threatened by the space debris. 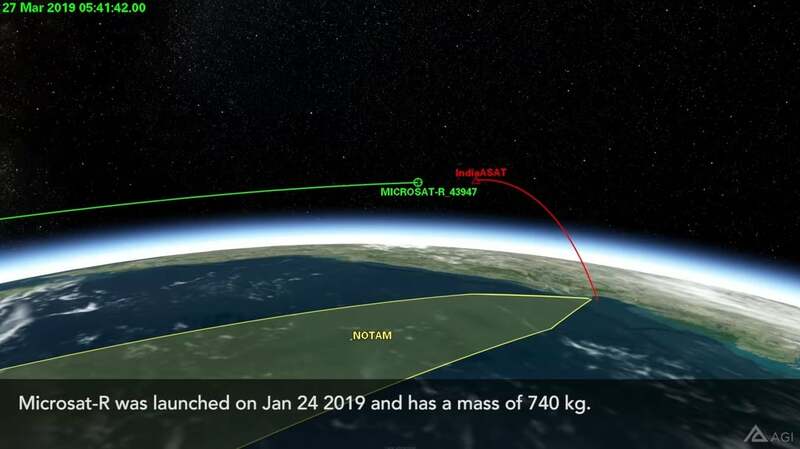 To demonstrate how much the debris could threaten the ISS, software-engineering firm Analytical Graphics Inc. developed a computer simulation of India’s satellite destruction and posted it on YouTube. However, according to G. Satheesh Reddy, chief of India’s Defense Research and Development Organization, the lower altitude shooting position was carefully selected. He told Reuters that their selection should reduce the risk of space debris flying everywhere, adding that it should clear within 45 days.